Updated April 9, 2019 | Written by Susan Chai, Esq. Use our attorney-crafted Moving Checklist template to account for all property when moving and to remind yourself of important pre and post-move details and considerations. Give legal notice to the landlord that the renter will be moving out. Outline the responsibilities and expectations of people living together. Text Template – just copy and paste! The Basics: What is a Moving Checklist? When filling out your checklist, be as detailed as possible. Make sure to include a thorough description of the property, describe its present condition, and add any additional notes that will help you keep track of it. 𑂽 Change of address Set up a forwarding address with USPS, change address for banks, credit cards, insurance companies, etc. 𑂽 Final walkthrough In order to ensure there’s no deduction from your security deposit, do a final walkthrough to ensure nothing is left behind and there's no damage to the property. 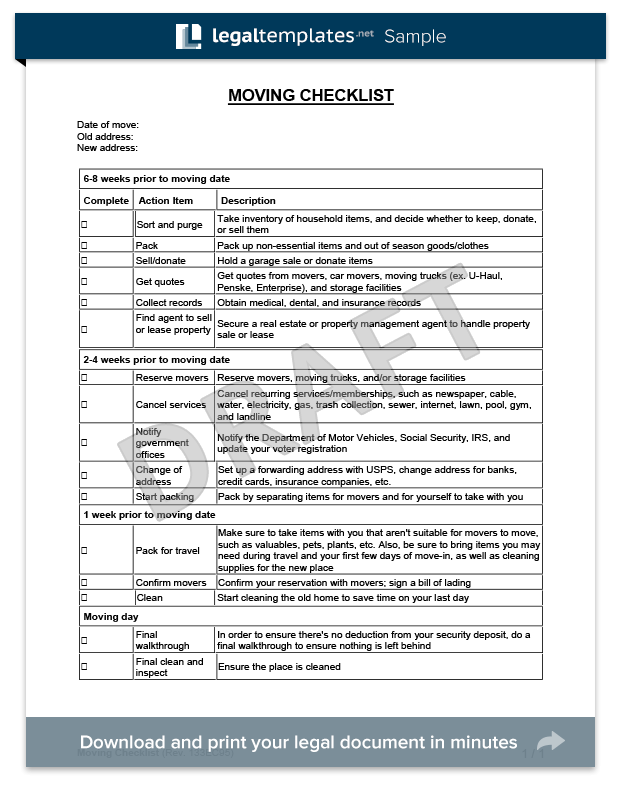 Our professionally drafted moving checklist template helps you account for all property before you move out or move in to a new place. Whether it’s something seemingly insignificant, like labeling boxes, or something more important, like notifying government and administrative agencies of your move, this checklist has you covered. Using a moving list will help ensure your property, and sanity, is preserved. Additionally, it will help prevent and effectively resolve disputes with movers, should anything be lost or damaged. If you are relocating due to work, some companies offer a relocation package, see if yours offers payment or arrangement of moving services. 2. The Basics: What is a Moving Checklist? A Moving Checklist is an important document to help you stay organized whether you are moving out of, or into a new home, apartment, or condo. The reality of moving is that it’s a lot of work, and is often left until the last minute to figure out important specifics, resulting in lost or broken property, arguments with movers, and a hectic move-out or move-in day. Just as driving cross-country is infinitely easier with a good map, or GPS, a comprehensive moving checklist makes the transition from one place to another seamless and organized. If you are moving and want to notify your landlord of your departure, check out our Notice of Intent to Vacate and Lease Termination. Before moving, first conduct a property audit to determine whether or not you even need or want to pack it. Some apartments already come furnished, so if that’s the case, gather up anything you don’t need and stick a “Yard Sale” sign in front of it. Comprehensive moving lists typically include three to four sections and primary milestones; taking inventory and pre-move essentials, the packing and moving stage, any last minute final details and considerations, and the move out day itself. If you have been the victim of a careless or unsafe moving company, you can report them by calling the FMCSA nationwide complaint hotline at 1-888-363-7238 (1-888-DOT-SAFT), or by visiting their website www.protectyourmove.gov. A moving checklist will help provide an organized game-plan of where to start when packing and unpacking. If it wasn’t already apparent, you need a moving checklist when you are moving homes, apartments, or residences. According to the U.S. Department of Transportation, every year, nearly 35 million Americans move homes or apartments. Additionally, in 2012, the Federal Motor Carrier Safety Administration (FMCSA) reported over 3,100 consumer complaints about household goods movers, a statistic that has been steadily increasing over the years. You want to minimize disputes with landlords and movers. A moving list should be an imperative for anyone located in the following cities and moving out of state, as they have historically received the highest number of consumer complaints over the last decade. Before selecting your movers, you should first conduct online due diligence by using one of the many moving company review sites. Proper research and due diligence could mean the difference between a smooth and seamless moving process, and damaged personal property, including that fine china passed down by your grandparents. In general, moving companies are responsible for loss or damage of property, however, sometimes that can be hard to prove. A moving checklist will properly document the property and its condition, leading to a clear-cut resolution should anything go missing or become damaged. Without a checklist, you risk complete and utter chaos when packing and unpacking, wasting time and energy on move-out and move-in day. .
Future disputes with your landlord or movers could require excessive and stressful legal action or arbitration. If your movers lose or damage anything, not only have you wasted time, you’ve also wasted your money. A moving checklist will help ensure a proper accounting of property, so there is a higher chance of receiving a refund after you move out. Failing to tidy up, or account for certain property could cause hassle for your landlord, and result in the loss of your security deposit.